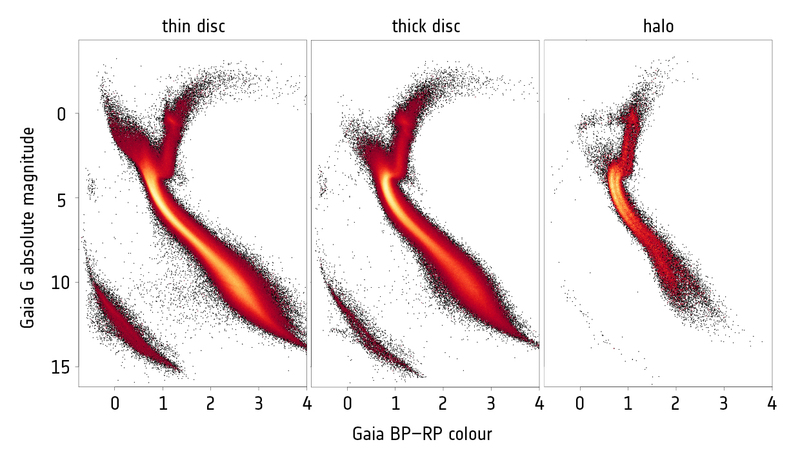 Three Hertzsprung-Russell diagrams obtained using data from the second release of ESA's Gaia mission, showing stars with three different selections based on the star velocities. The Hertzsprung-Russell diagram, named after the astronomers who devised it in the early 20th century, is a fundamental tool to study populations of stars and their evolution. It can be imagined as a stellar family portrait: stars are plotted according to their colour (on the horizontal axis) and brightness (on the vertical axis) and are grouped in different regions of the diagram depending on their masses, ages, and stages in the stellar life cycle. Information about stellar distances is fundamental to calculate the true brightness, or absolute magnitude, of stars. Combining this information with Gaia measurements of star velocities, astronomers have produced three different Hertzsprung-Russell diagrams with kinematic properties that are traditionally associated with three different components of the Milky Way: the thin disc (left), a flattened distribution of mainly young stars about 100 000 light-years across and 700 light-years in height; the thick disc (centre), which encompasses the thin disc, measures about 3000 light-years in height and contains increasingly older stars; and the halo (right), a roughly spherical distribution of mainly old stars that encloses the thin and thick discs, with a radius of about 100 000 light-years. The shape of the main sequence – the diagonal stripe across the centre of the graph, where fully-fledged stars are found – is different in the three diagrams, revealing the different stellar populations that are found in these three selections. The Hertzsprung-Russell of the thin disc shows features typical of a young population of stars, with many young hot stars at the upper left end of the main sequence, while increasingly smaller numbers of such stars are found in the thick disc and halo. The Hertzsprung-Russell of the selection of stars that are traditionally associated with the halo shows, for the first time, the imprint of two distinct stellar populations: the two roughly parallel yellow lines within the broader main sequence strip. This suggests that the fast-moving stars thought to belong to the halo encompass two stellar populations that originated via two different formation scenarios, calling for more detailed investigations. Acknowledgement: Gaia Data Processing and Analysis Consortium (DPAC); Carine Babusiaux, IPAG – Université Grenoble Alpes / GEPI – Observatoire de Paris, France.